Hibiscus tea is the infusion made from the calyces (sepals) of the Hibiscus sabdariffa flower, a herbal tea drink consumed both hot and cold by people around the world. It is also referred to as roselle (another common name for the hibiscus flower), flor de Jamaica in Latin America, karkady in the Middle East, bissap in West Africa, sorrel in Jamaica, and red sorrel in the wider Caribbean, and other names in other regions. Left: A glass of Agua de Jamaica (Cold Hibiscus Tea) in a restaurant in Cuernavaca, Mexico. Hibiscus tea has a tart, cranberry-like flavor, and sugar is often added to sweeten the beverage. The tea contains vitamin C and minerals and is used traditionally as a mild medicine. 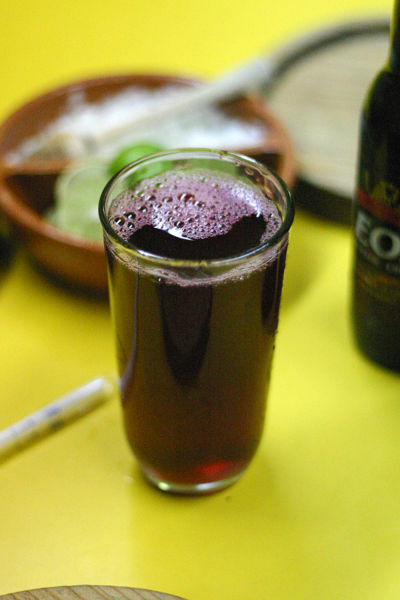 "Agua de Flor de Jamaica", also called agua de Jamaica and rosa de jamaica, is popular in Jamaica, Mexico, Central America, and parts of South America and the Caribbean. It is one of several common aguas frescas, which are inexpensive beverages typically made from fresh juices or extracts. Agua de Flor de Jamaica is usually prepared by steeping the calyces, along with ginger (in Jamaica), in boiling water, straining the mixture, pressing the calyces (to squeeze all the juice out), adding sugar, and sometimes a little rum (in Jamaica), and stirring. It is served chilled. 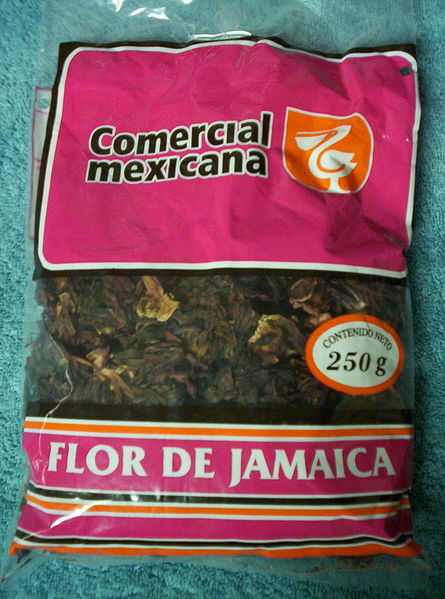 Dried hibiscus calyces, often labeled Flor de Jamaica, have long been available in health food stores in the United States for making this tea, especially in California and other areas influenced by Mexican customs. Flor de Jamaica has a reputation for being a mild natural diuretic.